Delivered in 2016 by Admiral, part of the Italian Sea Group, Tremenda’s striking lines and uncompromising design make her a head turner in any port. In near-new condition she is one of the newest yachts on the market and represents an excellent opportunity for those seeking a quality European build ready to enjoy immediately. The third yacht in Admiral’s Impero series, she is an all-aluminium semi-displacement yacht that features exterior styling by Luca Dini, with a sleek and modern interior by Gian Marco Campanino and Admiral Centro Stile. This luxury yacht is able to accommodate 12 guests, in five cabins. 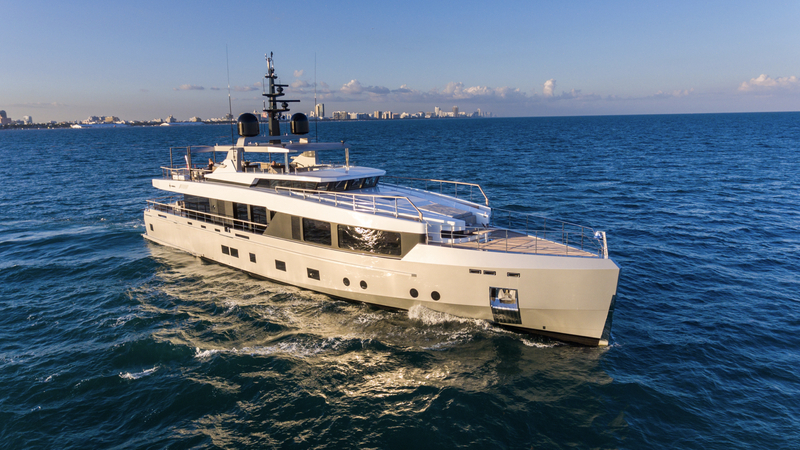 Her full beam master, with full beam ensuite, is in premium position on the main deck and boasts seascape views. Two VIP and two double ensuite cabins both with an additional pullman, all generously appointed, are located on the lower deck.